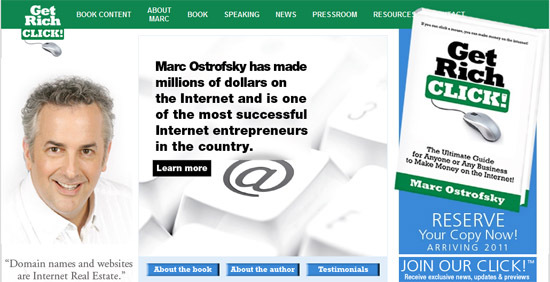 Marc Ostrofsky made headlines in 1999 with the $7.5 million sale of Business.com to eCompanies and, at the time, was the most expensive domain name ever sold. This, only a few years after he purchased the name for $150,000. Marc founded five high tech Internet and telecommunications magazines and a dozen technology trade shows, which were subsequently sold for millions. He is a true serial entrepreneur. He also founded www.idNames.com, an international domain name registry service that was sold to Network Solutions. Marc is the owner hundreds of premium and generic domain names, including MutualFunds.com, Bachelor.com, HeartDisease.com, and Photographer.com. He’s the co-founder and the President of Internet REIT, Inc., a next-generation Internet media company that owns and manages high-quality domain names. Some of his current sites include Blinds.com, CuffLinks.com, eTickets.com, and SummerCamps.com. Marc is about to release a book called Get Rich Click. It’s an up-to-the-minute “how to” guide to the new realities of Internet business showcasing all the ways to profit in a dynamic electronic marketplace. Marc shows how he’s made millions through internet businesses and how he’s continuing to do it today. His history and present ventures speak for themselves. You have such an amazing history it’s difficult to select an opening question. So let’s start with the present. What made you decide to capture your successful business strategies in the form of a book and share your stories with others? The book was a simple concept….it was my way of giving back to others. The simple fact is that my father and my sister were both College professors. I worked in the real world and now I’m the last one in the family to publish a book! I was successful in business. Now I can afford to do the book as it’s certainly not an income stream. Why the book? Two things happen often. A. People ask me “how can i make money online”. B. I have tested so many different ways and they all work at one degree or another. So, it seems obvious that a book was a good idea. 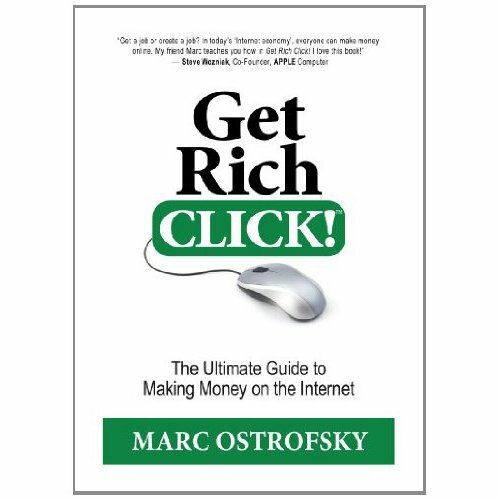 Got the name “Get Rich Click” years ago and decided THAT was the name I should use….in fact, it was THAT name which set off the idea of a book. I then set off learning the book publishing industry for 2+ years and now, it’s coming out MAY 2, 2011. What can readers expect to gain and learn from reading Get Rich Click? What do you to be the ultimate outcome of this book? Pay Per Click, Pay Per View, Pay Per Minute…there are 33 different “pay per” options availaibe on the internet for ways to make money with content. My favorite chapter is HOW TO MAKE MONEY WITH NO MONEY…. Your company Internet REIT, Inc. is said to have acquired an enormous portfolio of domain names and have been backed by Perot Investments and Maveron among other prestigious investors. How many domains would you estimate the company holds? Are these domain names for sale or leveraged in some other way to draw revenue? We have sold off the vast majority of the portfolio. The plan was to aggregate the names, increase the % we get from the search engines for that traffic and sell it off. The truth is, I was never in the company day to day…I only had the inititial idea, helped raise the money and it was managed 100% by others. You are obviously known for the legendary Business.com success. What initially attracted you to the domain industry and what was your first real success? My first business….a lemonade stand of course! Age 5 in Los Angeles, CA while my dad was teaching Business at UCLA. Then I learned that money comes from places other than my dad and I started really working at age 12 and never looked back. I LOVE WORKING….it’s fulfilling. But in the new age we live in…an age where the internet FUELS growth while knowledge and understanding are the greatest assets one can have, it’s truly the age of the entrepreneur. re: Business.com I always followed the story about 1-800-FLOWERS. It was amazing to me that he became a multimillionaire from a simple telephone number. So I watched and when the 1-900 “pay per call” industry started out, I was involved as the magazine publisher of VOICE PROCESSING Magazine. I lobbied AT&T to release me the number 1-900-932-8437 which spells out 1-900-WEATHER. The number was initially released to me and within a week, they “took it back” when they figured out what it spelled. It was their right, they OWN the numbers and my layers said I had zero chance. At one point, that number made $1,000,000 + every month or two. When my sister taught me about domain names, I realized I had another shot at it….so I came home and stayed up all night buying names like www.eBusiness.com; eFlowers.com and eBluebook.com for $70 for 2 years. I bought maybe 50 or so names that night. So far, it’s done me well as I’ve sold almost $20 Million in domain names. You have owned internet and telecommunications magazines and technology trade shows. You have even owned a domain registry. You’re a speaker and and author. While these are all generally internet related, they are vastly different businesses. What skills would you say that you possess that have allowed you to be successful in so many different areas? Wow…I like that question. Hmmmm….I need to think about it. I guess the right answer I feel if I don’t know the buisness I’m going to get into, I won’t be as good as I can be. So I spend as much time as I need to to LEARN ANY AND EVERY BUSINESS I AM GETTING INTO. Newsletters, Magazines, Trade Shows, Market Research, Conferences and Trade Shows….the common thread is INFORMATION. These are just different ways to buy/sell/resell information. The funny thing about information is that it’s value is totally different based on who has it and how needs it. In some ways, it’s a commodity. Yet in other ways, it’s EXTREMELY VALUABLE. Market Research Reports were an amazing business. I had a database of say 10,000 people in the telecommunications business. I would pay a freelance writer $8500 to write me a 200 page “report” on the state of the industry. We would sell from 5 to 150 of those at $7500 each! I moved on to domain names and websites looking at them as “real estate” and treating them as empty pieces of land awaiting a house or high rise. Actually, in 1994, I figured out that these domain names would be the new information sources and I went looking for the 5 parts of every newspaper…NEWS, WEATHER, SPORTS, BUSINESS and CLASSIFIEDS. I ended up buying Business.com for a world record price of $150,000 for a domain name. What was interesting was that the press said I was a fool. My answer was “Domain Names and Websites are Internet Real Estate” and I think this is a good investment. Turns out I was right. I sold the name – JUST THE URL – for $7.5 Million – and it went into the Guinness Book of World Records. Then I structured the deal to get a piece of the firm, which I did…and we sold it in 2007 for $345 Million! All in all, a good deal. Do you think it’s possible for anyone individual to get into the business of acquiring and profiting from domain names today, or has the opportunity come and gone for the little guy? Does it take huge investments to make money in this field today? There are three domain name markets. 1. New names. One example is this….it’s a recent REAL LIFE STORY and it happened to me! I was writing Get Rich Click and wanted to look for Digital based premiums…FREE giveaways that are digital based to give to people that buy the book. I looked and looked and found very little. I looked up the term “Digital Premiums” and for $8, I now own that domain name. I will develop it into a website for FREE STUFF that can be given away to help get folks to come to your site and buy your products. I read everything I can these days, look at what’s happening, what’s trendy and where things are going and I bet I buy 5 – 10 names a month – hoping one of them can be build out into a real income producing business one day. 2. Used and previously sold names. Just go to SEDO.com and you’ll see over 1 million domain names for sale. Type in a word like “media” and you will see 15,000+ names for sale with that word in it. I’ve helped create a monster here…actually a lot of monsters. People are buying $10 names and hope to sell them for hundreds, thousands if not tens of thousands of dollars. Some are worth that, most are not but the game is “finding the golden nuggets”. 3. International domain names. I am not in this space. I personally own and love the .biz and .info space outside of the .com and .eu space. But there are opportunities in the international space if one wants to take the time to get to know it. I’m a believer that we can’t master everything. It’s like a realtor specializing in a specific part of the city vs. the entire city. I suggest that folks specialize in .com, .biz and .info names. I also teach folks that it’s easier (but more work) to double your money buying 10 .biz and .info names for $1000 each vs. one $10,000 names and selling it for $20,000. 1. CuffLinks.com – we sell a great wonderful and profitable niche…CUFF LINKS for men (and women). Small physical product but the LARGEST product we sell. 2. BLINDS.com – $75 Million + a year selling window coverings and blinds. We run the site, take the order, strip money, electronically send the order to the blinds manufacturer…and the physical products is dropshipped directly to the client! We touch NO BLINDS. 3. SummerCamps.com – the largest website to help parents find the proper summer camp for their kids. ALL income from ads and listings. We are WAY TO CHEAP for these as one new camper pays for 5 years worth of ads. There are 5 different business models….for you. ALL make money. I now look at these as investments. Imagine if you owned any ONE of these and put 100% of your time into building it out? We’ve talked only of your enormous successes. Have you had any setbacks or failures to speak of that might be of lesson to other entrepreneurs as they look to find there niche in today’s business environment? Setbacks? Yes. While I prefer to have the bad happen to others and I simply learn from them, you can’t learn all of the bad first…you have to get some arrows in your own back along the way. One of my favorite people ever was an employee names Jackie Maestas. She didn’t trust a sole and I loved that as she was usually right on target. She said “I live to work”….while most others “work to live”. It’s a very telling statement. So, hiring the folks that came in late, took 2 hour lunches and left early is the part of the business I truly hated (and still do). On the business side, I founded a trade show called “The Home and Family Computing Supershow”. It was a Consumer Electronics Show for the masses. it was such a cool event….1000’s of people coming to a convention center on a weekend to do nothing but PLAY WITH electronics. It worked. The problem was that I staffed up – WAY up – to manage the event and after the 4 events, a MICROSOFT employee said if we can’t be the ONLY software vendor, we’ll create a competitive show ourselves…which they did. What happened? They split the market. There was not enough money in the market for 2 identical shows in the top 10 cities. The funny part of the story was that BOTH events were killed the same WEEK. We were going to shut it down and heard they shut their show down 2 days earlier. I would leave with this….GET RICH CLICK is a book about how ANYONE or ANY BUSINESS can make money online. The big difference is that I have done it over and over and over and over again. Not just once. I take from personal experience and then from 100’s of others that are doing it each and everyday. Realize that NOW is the time…YOU HAVE WON THE LOTTERY being around at this time in history. Our grandparents, parents nor kids will have the same opportunities we have in this new business world called the internet! BUY THIS BOOK if you want to find story after story about how you too can change your financial life in the age of the internet!